Nature’s Secrets, a large desert landscape painting by Joshua Lawrence Meador, hung prominently in every home my mother lived in. My parents purchased it in 1963 as the centerpiece of our living room. They were told Nature’s Secrets was painted in Palm Springs, one of their favorite vacation destinations. My mother had a great appreciation for the arts. Her father, Harold Newsom, was a lesser-known Bay Area painter active in the 1920-40s. Her great uncles were the Newsom Brothers, well-known Victorian-era California architects, famous for the wildly ornate Carson Mansion in Eureka, California. A few years ago, I began doing research on Josh Meador and discovered the significant role his employer, Walt Disney, contributed to the school of desert artists. Meador was Disney Studio’s head of special effects from 1939-60. He won the 1954 Academy Award for special effects in the Disney animated film 20,000 Leagues Under the Sea. Though best known for his special effects in Disney Classics including Snow White, Bambi and Fantasia, Josh Meador was trained in fine arts at the Art Institute of Chicago, where he graduated with honors in 1935. Almost immediately, he landed work at Disney Studios. When I was growing up in La Canada, California, Josh Meador lived in nearby La Crescenta, and was a family acquaintance of ours—along with his fellow Disney artists Preston Blair and Ralph Hulett. Meador was also close friends with the noted Western artist Conrad Buff, who lived in nearby Eagle Rock. My interest in Meador — in addition to the family connection—is because his career somewhat parallels my own. I earned a BFA in drawing from the California College of Arts and Crafts, and have worked as a commercial illustrator for over 35 years. When I was growing up, I studied illustration with Disney artist Ray Vinella. Like Meador, I attended art school, and have a fine arts degree, but make my living as a commercial illustrator. Also, like Meador, I am a painter, and use my training to create fine art. In the early 1930s, Disney started coming to Palm Springs to visit Smoke Tree Ranch, a private enclave and exclusive dude ranch. He built a home there in 1948. 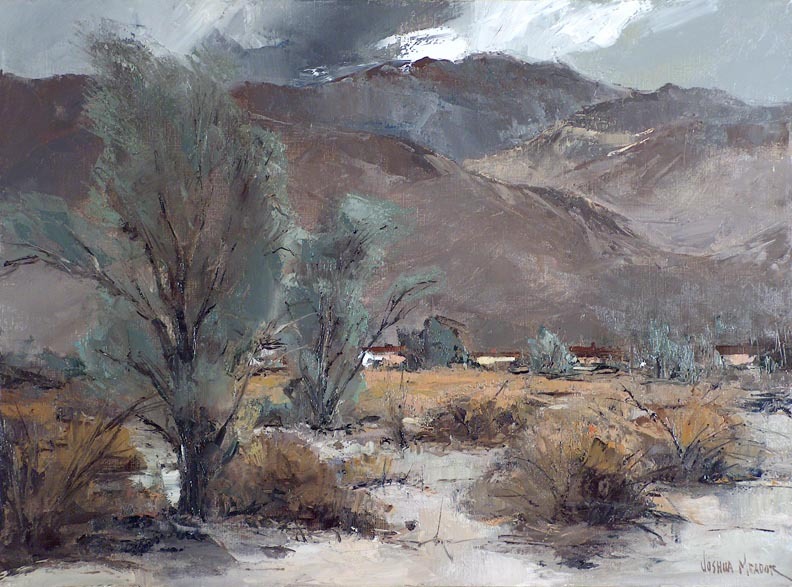 His other major accomplishments overshadow the fact that he was an ambassador for the desert, and frequently invited desert artists who worked for his studio to paint at the ranch. Disney artists Peter Ellenshaw and Eyvind Earle (known for his visionary serigraph art) also visited the ranch, says Michael Labrie, director of collections for the Walt Disney Family Museum. 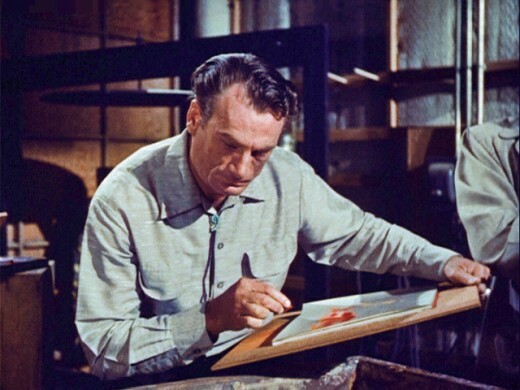 While not a Disney artist, the popular desert painter Victor Clyde Forsythe was a friend of Walt’s and also painted Smoke Tree Ranch. “It appears Walt used stays at his Palm Springs ranch as one of the perks he passed out to his friends and valued employees — his version of Hearst Castle,” says Daniel Rohlfing, co-owner of the Bodega Bay Heritage Gallery. Rohlfing’s wife and business partner Linda Sorensen handles the Meador estate for the gallery. Together Dan and Linda have done much to document and promote Meador’s work. Meador’s granddaughter, Talitha Meador, says the artist spent time in the desert mining as well as painting—making him a true desert rat. Disney must have been especially fond of Joshua Meador’s work, as the family collected over 50 Meador paintings. Smoke Tree Ranch and the surrounding desert served as inspiration for Disney’s 1953 nature documentary The Living Desert, part of the True Life Adventure film series. Filmed in Arizona and also the Coachella Valley, it won the 1954 Oscar for Best Documentary and (some say) inspired the nature documentary genre still popular today. Walt Disney commuted to his desert getaway in his eight-passenger Beechcraft Queenair, according to a 1965 article in Palm Springs Life. Today, Smoke Tree Ranch is an exclusive resort. The Disney house has been preserved, and with it—according to Chief Operating Officer Tracy Conrad—a collection of plein air desert landscapes by Josh Meador. Meador worked on animation effects for the Living Desert film. 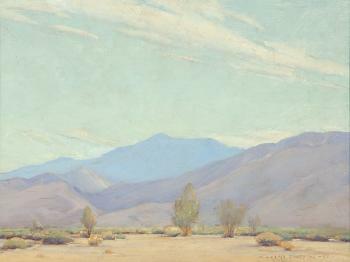 According to Palm Springs Life: “The cameraman went to the Salton Sea to photograph mud pots and out on to the desert to record the opening of the night blooming flowers.” Lloyd Mason Smith, an early director of the Palm Springs Desert Museum (today the Palm Springs Art Museum), worked closely with the crew. The success of the film and Disney’s love of the desert in turn led to the (now defunct) Nature’s Wonderland exhibit at Disneyland. The exhibit had several incarnations: First mule trains, and later a narrow-gauge railroad took passengers through desert canyons. Walt Disney’s daughter, Diane Disney Miller, says her father sent Meador to Smoke Tree Ranch on assignments to do plein air landscapes. It is unclear whether these assignments were to produce studies for Disney film productions – or to paint fine art to decorate the Disney home. 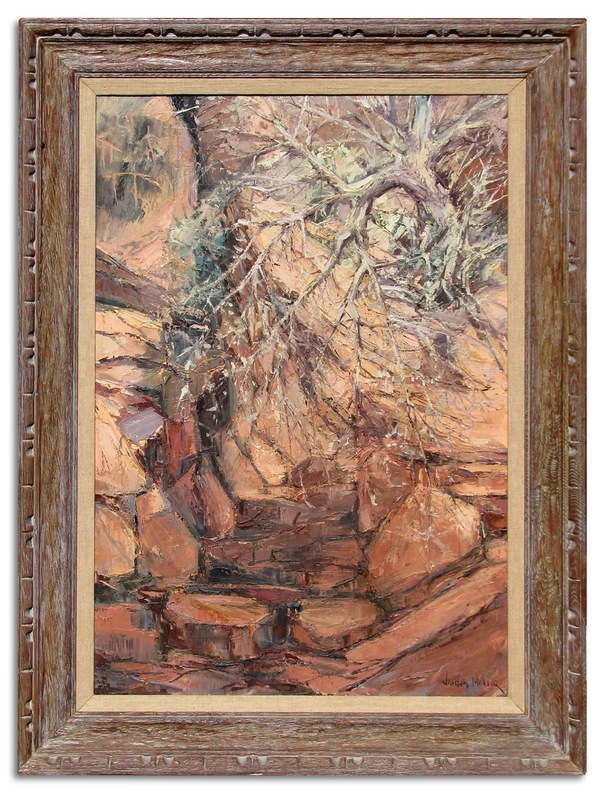 Diane Disney Miller has seen our painting and believes it is indeed a plein air piece that was painted in the canyons near Smoke Tree Ranch — possibly in Andreas Canyon. There is a second, similar Smoke Tree Ranch desert painting displayed at the Disney Family Museum at the Presidio in San Francisco. In the upper left of our painting, there are distinctive petroglyphs or pictographs. They could be a loose impression, or possibly a faithful rendering that might be used to identify the exact spot the painting was made. Coachella Valley archaeologist Harry Quinn says he does not know of a panel that looks like this in Andreas Canyon, but the figures are true to local rock art. Was Nature’s Secrets a plein air study created on assignment for the Living Desert film and the Living Desert installation in the Nature’s Wonderland attraction? The son of Disney artist Ralph Hulett looked at the painting recently, and placed it somewhere in the early 1960s, but the Meador’s numbering system suggests it was painted earlier. If the painting dates to the early 1950s, it may well be linked to the film. The title alone suggests a connection. 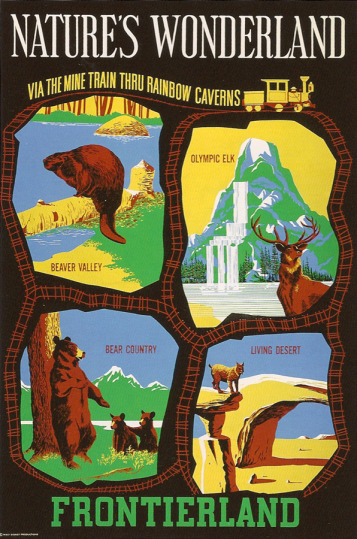 The palette and composition also resembles the dioramas in the Nature’s Wonderland attraction known to every kid who grew up in Southern California in the late 50s and 60s. According to Linda Sorensen, Nature’s Secrets, which measures 40 x 27”, is the largest known work by Josh Meador. Joshua Meador was living in Mendocino County when he died in 1965. He was recently honored by his hometown of Columbus, Mississippi, with a Josh Meador Trail marking points of interest in his life. While his Columbus days are well documented, it’s less known what trails he took through the desert. Further research will uncover more on Meador and Disney’s connection to the Smoketree School. Nature’s Secrets has been in the writer’s family for decades. They are now ready to pass it on to a new owner, and ideally return it to its rightful home in Palm Springs. For more information: illustration@karledwards.com. once again, thank you for your time devoted to the website. all who view it are better off for it. Disney’s Living Desert Film is one of the neatest bits of Disney history I have learned, and how wonderful to learn more about Meador as well. Thank you, Ann! Thank you for posting this information. My father worked for Josh as a cartoonist for Disney in the early 1950’s. Josh stayed at my Grandparent’s Motel, Shadow Mountain in Indio, many times and one of his desert paintings hung for years in that lobby. My grandparents also owned a home at La Crescenta as well and I have many old photos of my parents, grandparents, Josh and his wife lounging by the pool there. One of my greatest losses over time was the desert painting. I returned it to my father after my grandparent’s death and at his death his estate was rummaged and ruined by his then wife. I never saw it again, much to my dismay as I have many fond memories from that early time in my life. That’s a great story about the missing Meador painting that once hung in the lobby of the Shadow Mountain Motel in Indio. If you have any old photos of the lobby with the painting, please send them. I’ve been trying to figure out where the name “Shadow Mountain” came from. If only we could ask your grandparents. Clyde Forsythe has a painting by that name, and there’s a well-known resort in Palm Desert called Shadow Mountain Inn. But no actual mountain by that name, as far as I know. When I was younger I was a Price Waterhouse Auditor and one of my clients was RETLAW ( Walter spelled backwards) it was owned by the Disney daughters. In the offices were several paintings by Meador, others by Dali.. it was a treat working in such a gallery. My parents have recently acquired multiple original oil paintings of desert scenes, one of which was given to me of 3 horses, possibly from this same collection. I would love to find out more about his work and possibly have someone look at them, please contact me if you might be interested.